2015 offshore fishing season off to a great start! Southern California anglers were wondering if the 2015 Southern California offshore fishing season was going to start producing fish at turn of the year. They received an affirmative answer to that question with bluefin tuna, yellowtail, skipjack and bonito being caught out by the Cortes and Tanner banks during the first two weeks of January. 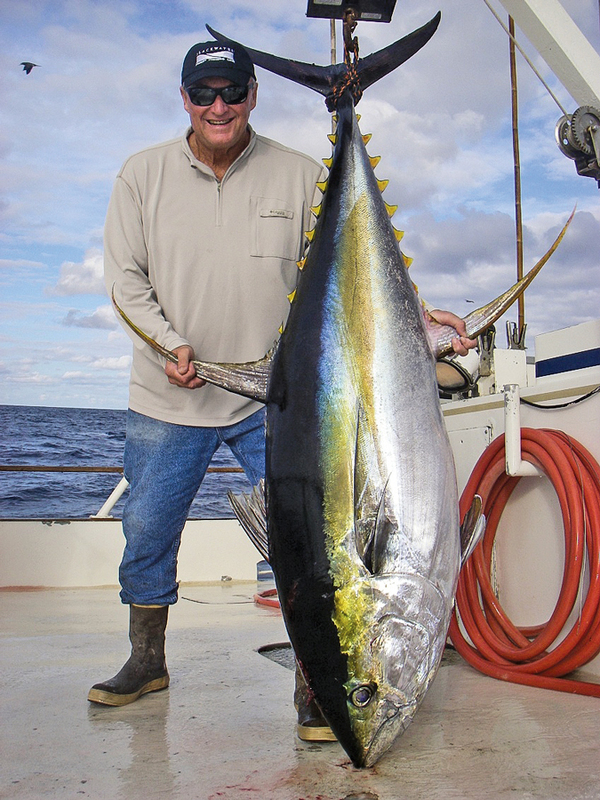 It is very unusual for there to be tuna biting in Southern California offshore waters during the month of January and with water temperatures continuing to hold in the 62 to 64 degree range. The question is now whether there will be bluefin spending the entire winter in Southern California offshore waters. The 2014 offshore season was one of the best in many years and the 2015 season is off to a great start. The past weekend saw private boaters and sport boats fishing at the Cortes and Tanner banks and there were bluefin tuna, yellowtail and bonito biting. In December there were also skipjack and yellowfin tuna in the mix but those species appear to have left the area for warmer waters. One of the sportboats that fished the area over the weekend was Tribute out of Seaforth Sportfishing had a 1.5-day trip with 32 anglers catch 66 bluefin tuna, 8 bonito and 18 yellowtail. H&M Landing had Invicta out on a 1.5-day trip with 19 anglers that caught 26 bluefin tuna and 2 yellowtail. Pierpoint Landing had Toronado out on a 1.5-day trip with 13 anglers that caught 22 bluefin tuna, 3 yellowtail and 22 bonito. The fishing along the San Diego County coast continues to be highlighted by flurries of yellowtail action. Most of the yellowtail have been in the 18- to 25-pound range and the two best areas have been while fishing at hard bottom spots outside of Box Canyon (located below San Onofre) and at The 270 area outside of Mission Bay. Other hard bottom areas that have also produced yellowtail have been outside of Leucadia, Solana Beach, Del Mar and La Jolla. In addition to yellowtail, anglers fishing coastal waters have been catching sand bass, calico bass, bonito, sculpin and an occasional halibut or white seabass. Anglers should continue to note that the annual two-month rockfish/groundfish closure went into effect in California/United States waters on Jan. 1. The good news is that the sculpin closure ended on Jan. 1. The fishing for rockfish does remain open in Mexican waters while the two-month closure period is in effect on the California/United States side of the Mexican border. Capt. Joe Cacciola of Sea Star with Sea Star Sportfishing recently reported he saw some small schools of yellowtail with the scanning sonar while fishing off Box Canyon but said they could not get those fish to respond and bite. He ended up finding some larger schools of yellowtail while fishing about 1.5 miles below Box Canyon and eventually got some bites from those yellows. Private boater Tom Golding of Last Buck was recently headed out to the Tanner Bank to fish for bluefin when he encountered a mechanical problem at 3:00 a.m. while they were 62 miles outside of Long Beach. The mechanical issue forced him to turn around and head back home. Los Coronado Islands continue to produce a mix of bonito, yellowtail and assorted rockfish. On a recent day of fishing, the San Diego out of Seaforth Sportfishing had 16 anglers on a three-quarter day trip catch 35 yellowtail and 11 bonito. The same day of fishing also had the Mission Belle out on a three-quarter day trip with 9 anglers that caught 5 yellowtail and 7 bonito. Private boater Harry Okuda of Alfresco III fished Punta Colnett on a recent 1.5-day trip aboard Pacific Queen out of Fisherman’s Landing and reported about the trip. Their fish count was 31 anglers catching 83 yellowtail, 126 rockfish and 76 lingcod. Okuda said there were a lot of quality sized fish in their catch and that the big lingcod of the trip was up around 25 pounds and that the jackpot winning fish for the trip was a yellowtail that weighed in at 33 pounds. The 2015 fishing season is off to a fast start and is producing winter time action on species that one might expect to be catching during the summer months. Keep on fishing and I hope to see you out on the water! Bob Vanian is the voice, writer and researcher of the San Diego-based internet fish report service called 976-Bite which can be found at 976bite.com. Vanian also provides anglers with a personal fish report service over the telephone at (619) 226-8218. He always welcomes your fish reports at that same phone number or at bob976bite@aol.com.